Australia vs Pakistan 1st test being played in Dubai International Cricket Stadium Dubai from 07 Oct 2018. This is the 1st match of Series Australia vs Pakistan in UAE, 2018. Pakistan played very well without top order batsman Fakkar Jaman and dominated Australia. So Australia struggling in the last inning. Due to the best batting performance by Australian batsman Usman Khawaja 141 runs in the last inning, Australia could able to draw this match. Hi friends, I'm Gyan Ranjan. In this blog post, I will give you the detailed description and live cricket score updates of Australia vs Pakistan 1st test 2018, Memorable moments also available to read. The batsmen of Pakistan played very well among them 4 batsmen played the amazing inning. Imam-ul-Haq 76, Mohammad Hafeez 126, Haris Sohail 110 and Azad Safiq played an inning of 80 runs. Pakistan builds a big total 482/10 in his 1st inning with the help of great performance of these batsmen. Peter Siddle 3 and Nathan Lyon got 2 wickets for Australia in this match. Mitchell Starc, Jon Holland and Marnus Labuschagne got the 1-1 wicket in the 1st inning of Australia vs Pakistan 1st test. Pakistan 482/10 in 164.2 overs in the 1st inning. Australia started his first inning very well but after the wickets of Usman Khwaja 85 and Aron Finch 62, all batsmen of Australia failed against the great bowling attacks of Pakistani bowlers. Australia could score only 202/10 in 83.3 overs in his 1st inning. Bilal Asif got maximum 6 wickets and Mohammad Abbas got 4 wickets in the 1st inning of this match. 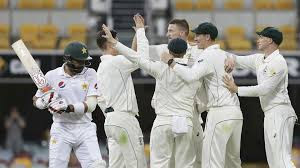 Australia started his 2nd inning with the passion but after losing the wicket of Aron Finch 49, lbw by Mohammad Abbas lost another 2 wickets without adding any runs in the team total 87 runs. Shaun Marsh and Mitchell Marsh lost their wickets without scoring. Mohammad Abbas got all 3 wickets in the 4th-day match. Australia was at 136/3 at the end of the 4th-day match and need 326 runs in the last day of this Australia vs Pakistan 1st test. Australia is in trouble due to the best bowling performance of Pakistani bowlers Mohammad Abbas and Bilal Asif and because of the bad performance of Australian batsmen except for Aron Finch and Khawaja who played well in this match. Usman Khawaja again played an amazing inning of 141 runs with the help of which Australia could draw this match.